America’s birthday was last week so naturally everyone at Beardilizer is getting pumped. There is nothing more rugged than grilling, drinking beer, and shooting off fireworks. It’s hard to not get pumped about being a beardo on the 4th of July. Put on your best Chuck Norris t-shirt and grab your cooler. 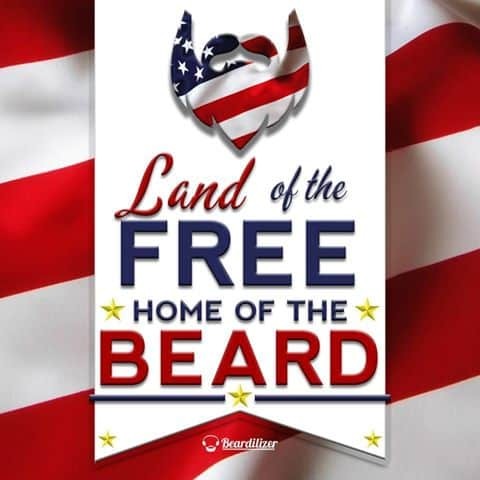 It’s time to buy some fireworks and talk about what beardos (and Beardilizer) has done to make this glorious beardy nation even better. First off, all of us at Beardilizer are still beaming with pride at the hard work that our own Dennis Morgan has put in to help out men who are experiencing homelessness. Beardos who give back are the best beardos. Living in the US can be a luxury but many of our countries citizens have it pretty rough. When we show compassion to those less fortunate than us, we help make the world a better place. Our main man, Dennis, consistently challenges us to not only bring our best beardy game but for us to become better people. The charity fundraisers that happened all over the country in honor of helping people out are what set the bearded community apart from the rest. Our beardos are always the first to help out and try to raise money for a good cause. No Shave November ring any bells? What is not amazing about growing out a great beard for an even better cause? It’s important to recognize those regal manes and the work that they have done in order to bring awareness to challenging issues. Again, beardos are the f’ing best (but you already know that). Unity beards are always something that makes beardos stand up and be proud. No Shave November, all of the beard competitions and even spending time with your local beard club are part of being involved in something bigger. Having unity with those in your community is huge. That is why when one of our intrepid interns found this article all of the dudes at Beardilizer were speechless. One or two of them got a little choked up, we can’t lie. More often than not you do not see police officers with beards – it’s just not their thing. When Massachusetts police officer Lt. George Lebonte developed a very aggressive form of cancer, his unit swarmed around him in support. What did they do? They all grew unity beards. It’s important to look back at the great year beards have been having. More beards are in the movies than ever. A beard helped the Oscarless Leonardo DiCaprio get his act together. Beards are helping make our communities better, helping out those who are in need, and changing the way that society as a whole looks at beardos. Gone are the ideas that bearded folks are deviants – they’re the guys helping out, making it easier for people to have happier, healthier lives. Beardos are giving back to their respective countries and that’s why there is no need to make America great again. The beardos got that on lock like six months ago. Get yourself some beard wax (it is humid outside after all) and shoot off some fireworks. Happy BELATED Birthday, America!